We at TheTwoScoops love a good afternoon tea (who doesn’t love miniature food? 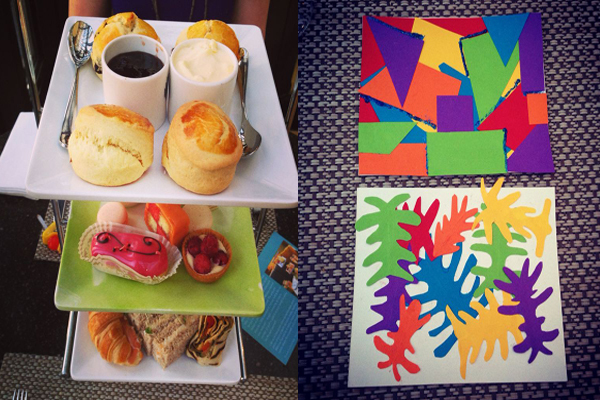 ), and we were lucky enough to pay a visit to the Terrace Grill & Bar at Le Meridien Piccadilly this week to sample their extra-special – and very colourful – Matisse Cut Outs afternoon tea. In celebration of Henri Matisse: The Cut Outs exhibition at the Tate Modern, one of the exhibitions of the summer, the tea brings the flavours of Matisse’s native France to your plate, in a suitably artistic fashion. We were treated to Jambon de Bretagne and Brie-filled mini croissants, Provencal vegetable wraps and salmon sandwiches, warm scones with clotted cream and jam and an array of delicious, brightly-coloured pastries. We devoured macaroons, Battenberg slices, mini raspberry tarts, a bright blue opera cake and a hot pink éclair; all cut at jaunty angles and placed on the plate like a work of art. The Mattisse Tea also came with an accompanying cocktail – a fusion of gin and rose champagne, with an artsy twist of orange peel – and a tea blend of choice (we went for Assam). If gorging on all the scrumptious goodies wasn’t enough, the tea came with an arts and crafts box filled with coloured card, scissors and pens to make your own Matisse Cut Outs-inspired postcard. Neither of us could remember the last time we got creative with glue and glitter (and we forgot quite how much fun it is!). The postcard then gets sent out to a friend of family member of your choice and acts as a 20% off voucher for their next visit to the restaurant (if receiving your colourful masterpiece in the post wasn’t quite enough!). 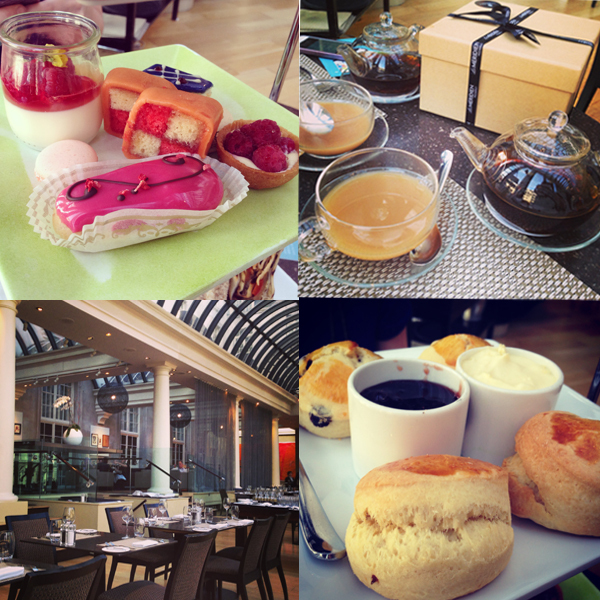 The Matisse Tea costs £30 and runs until May 31st, so get on down to this central London hotel for this afternoon tea with a twist. It won’t just excite your taste buds, but it will also get your creative juices flowing too!